The finishing phase involved a few steps backwards, in order to take the forward steps. Murphy's Law comes to play when conscious that time is running out, such as the power going out for 2.5 hours in our area. 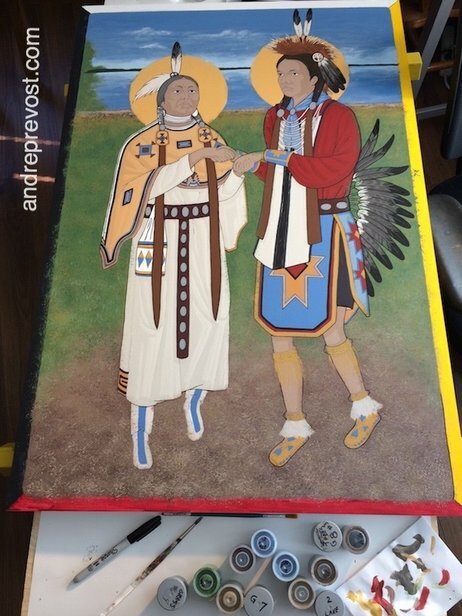 But the icon is completed and I now need to get the 2 coats of varnish done, hoping the 1st coat dry quickly so that I can get the 2nd coat done before day's end. nother very day today, with a few more changes. I'm just about done restoring edges and such on the figures, after having worked on the background around them. I've also started putting in fringe etc. to see what changes I need to make etc. 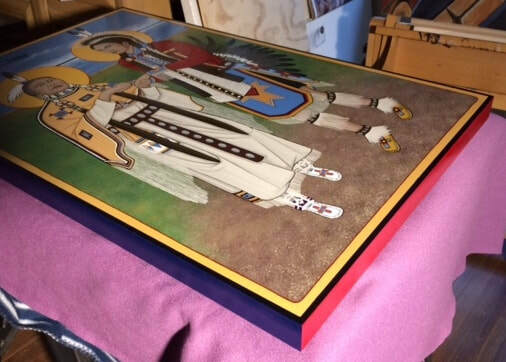 I've only got 4 days remaining before the icon will need to be varnished on Thursday, allowing enough drying time before it gets packed on Saturday. It is slated for delivery at Horseshoe Bay on Sunday, as it will be driving to the Lac Ste. Anne Pilgrimage which begins on July 22nd. But before then, depending how the next 4 days go, there may be some very long days ahead. Today was about working on the background. For one, it helps to confirm colour choices, but it also needs to be done before going any further as much of today's work went over edges and parts of the figures. The background isn't fully developed yet, but once that is done, the task of restoring begins on what was undone on the figures and Four Direction colours. The design for the St. Ann icon is in place and the writing begins tomorrow. The actual design has been inked in on the panel, but without all the fringe. Those will need to be added as detailing once everything is painted underneath. The next few weeks will be very busy as the icon needs to be completed in time for delivery on July 16th. Preliminary design inked in on panel. More information will be posted about the image. 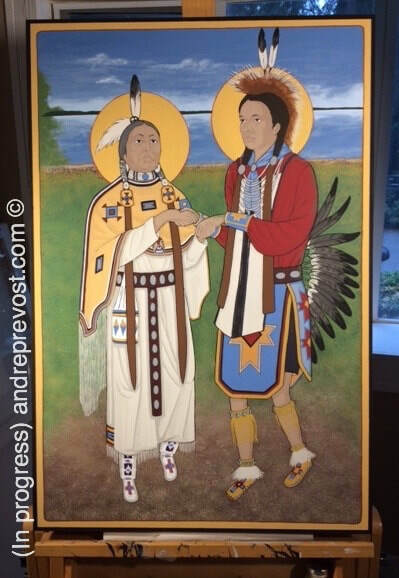 While waiting for the deposit to come in for the St. Kateri icon, in order to get the materials to construct its board, I've prepared the full scale base design for the St. Anne icon. I'm also in the finishing stages of gessoing the cradled wood board for that icon as the client wanted it to transport easily. 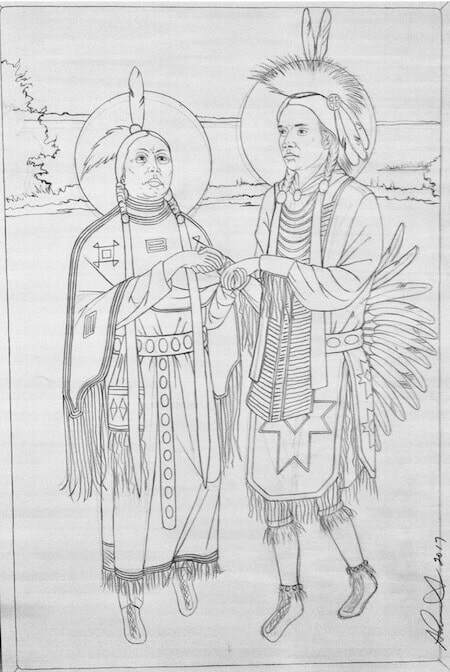 The St. Anne icon will also be a First Nations icon, honouring the 'Grandmother'. 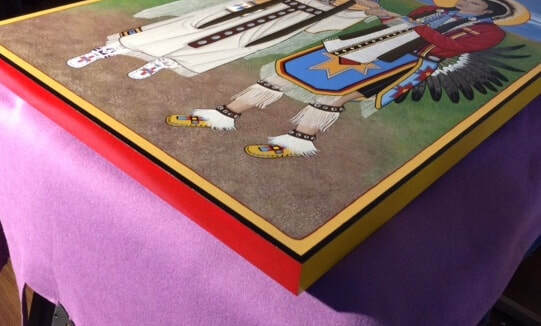 Once the design is transferred onto the board, I can add it to this journal.